It's Your Home Away from Home! One of the best parts about going to college at Northwestern is living on-campus and being around others with similar interests, as well as those with varied life experiences and cultural backgrounds. Whether you’re an incoming freshman or a returning senior, the convenience of living so close to your classes, the cafeteria, the snack bar, the library, the wellness center – everywhere – can’t be matched. Also, we’re one of the safest and most affordable campuses in the state. Living on campus also will help bridge the gap between living at home with your parents and living on your own for the first time – all without having to worry about cooking for yourself. The experiences of living “on your own” will give you important life skills needed for adulthood. By living on campus, you’ll be more active in campus clubs and student events because you’ll know what’s happening around you every day. Studies show that you also may make better grades and have a better chance at graduating – not to mention that you could possibly meet some of the best friends you’ll ever have. Join us in University Housing and make it your Home Away from Home! Fall semester Move-In Day for all residence halls is the Thursday prior to the first day of school beginning at 10:00 a.m. Please go to the front desk of the assigned residence hall to start your check-in process. There will be a Resident Assistant to assist you. Several of the forms on this page are fillable PDFs, so you may need to have Adobe Acrobat Reader installed on your computer. You also may need to save the PDF to your hard drive first, fill it out, save it and attach it to an email to send to wmadair@nwosu.edu. If you are using your smart phone to fill out these fillable PDFs, you will need an App for Adobe Acrobat Reader. If you’re planning to live in University Housing, you’ll need to fill out and submit the information below. Applications will not be considered complete, and room assignments will not be made until providing this information. Everyone living in University Housing during the fall and/or spring semesters must fill out this form and choose a meal plan. This form also contains the Meningococcal Waiver and other information about Meningitis. This document also must be completed and returned with the Housing form; however, it requires a written signature. These forms are a fillable PDFs. If you are using your smartphone to fill out these fillable PDFs, you will need an App for Adobe Acrobat Reader. All housing residents are required to have a meal plan. You can use your meal plan in the Student Center Snack Bar or Coronado Café. Payment will come by having your current student ID scanned. Use the breakdown found in Paying for College to choose what type of room and meal plan you are interested in. For your total room and board cost, add the room cost and board cost together. Complete this form if you are planning to stay in University Housing over the summer. $100.00 deposit required if one has not already been paid. This is a fillable PDF. You may need to save the PDF first, fill it out, save it and attach it to an email to send to wmadair@nwosu.edu. Complete this form each year when you and at least one sibling attending Northwestern are living in University Housing. This scholarship waives the cost of a semi-private room for one student’s bill. Both siblings will need to live on campus. Complete this form if you are a freshman and want to request living off campus. Complete this form if you are a freshman and want to continue or non-renew your housing contract. The renewal form is a fillable PDF. You may need to save the PDF first, fill it out, save it and attach it to an email to send to wmadair@nwosu.edu. Housing personnel will consider all applications for housing with great care to pair students who are thought to be most compatible as roommates. They also consider which residence hall will be better suited for each student to create strong and well-balanced communities. This process allows for students to live within an environment of wide-ranging personalities, interests and cultures. All first-time freshmen must live in university housing to fulfill the Freshman Residency Requirement or must apply for an exemption. Generally, freshmen also will have a roommate. Returning students must complete a Continuing or Non-Renewal Housing Contract at the end of each semester (fall and spring). At this time you will receive an email from the Housing Office indicating it’s time to fill out the online form. You will be able to request the same room, request a change in rooms or cancel your housing contract at this time. Housing personnel will consider the requests for changes in room assignments and notify you if the change has been granted. All first time freshman, attending the Alva campus, are required to live in university housing for two academic semesters (only fall and spring semesters apply). Freshman who want to request living off campus must complete the Freshman Residency Exemption Form for approval/denial. Freshman who fail to complete the freshman residency exemption process, or who are denied the exemption, will be charged for university housing for two academic semesters. Freshmen who are removed from housing for any disciplinary reason may be charged for two academic semesters. This policy is in place to help increase your involvement while on campus and to ensure your personal and academic success. Northwestern's research consistently shows that freshmen residing on campus have higher GPAs than freshmen living off-campus. 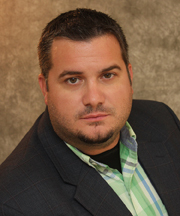 This research is consistent with the national research on freshman GPA's and retention rates. If you would like to appeal the residency requirement you will need to fill out the Freshman Exemption Request Form and provide relevant documentation to support your request. Exemption forms in print also can be obtained by contacting the Director of Students/Housing at (580) 327-8418. 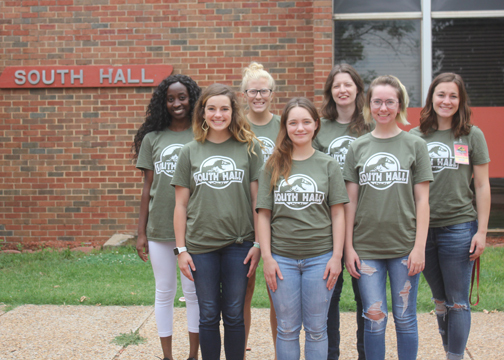 Resident Assistants in South Hall include: (left to right back row) Simisola Olatunji, Kayla Gourley, Patricia Pixler, hall supervisor Veronica Nelson; (front) Jacey Bales, Bethany Pierce, Sara Houchin. 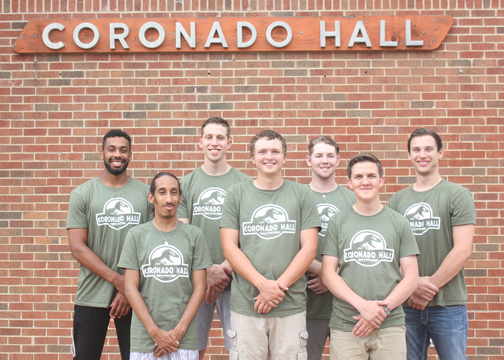 Resident Assistants in Coronado Hall include: (left to right back row) Cedric Collinge, Hayden Graham, Colton Whitehouse, hall supervisor Jacob Boggess; (front) Sterlin Broomfield, J.C. Wells, Ethan Sacket. 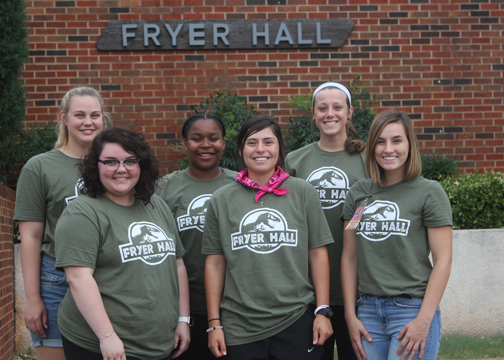 Resident Assistants in Fryer Hall include: (left to right back row) Bailey Cook, Derek Blow, Aleysa Franz; (front row) Cede Kirkhart, Estrella 'Starr' Guardiola, hall supervisor Macie Malone. 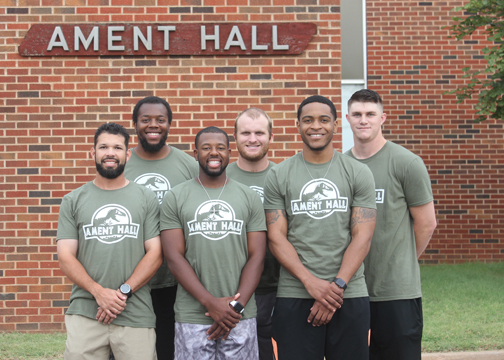 Resident Assistants in Ament Hall include: (left to right back row) hall supervisor Oliver Willis, Zack Short, Matt Goertzen; (front row) Luis Reyes, Dash Johnson, Greg Minor. If you are interested in working at Northwestern as a resident assistant (RA) in any of the student housing options, please apply using the Resident Assistant Application form. Resident Assistant responsibilities are numerous as the RA is the focal point for the day-to-day operation of his/her floor. The RA is at one time: student, community developer, referral agent, business manager, peer, friend, and disciplinarian. The diversity of roles and responsibilities is challenging and calls on the RA to develop organizational and interpersonal skills. The position of RA provides an opportunity to maximize self-development, maturity, and confidence during the college years.